In May CORE-6 teamed up with the RailAlliance and shared their ‘sector’ at Railtex trade show at Birmingham’s National Exhibition Centre. 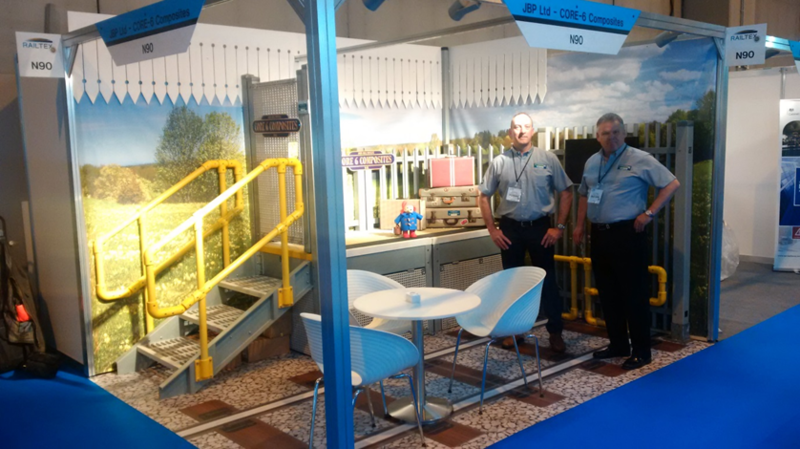 This was the first time JBP Ltd have exhibited a rail-orientated exhibition and due to the interest in our CORE-6 range of composites JBP have chosen to join forces again with the RailAlliance by exhibiting at their Rail Live show in June. This entry was posted in News, Rail on June 6, 2017 by Adam Bennett. This entry was posted in News, Rail on May 25, 2017 by webcon. This entry was posted in News, Power, Rail on March 28, 2017 by webcon. Application: Platform extension used in Rail industry. Core6 Pultruded GRP extension was used to accommodate longer trains. There was a need for the platform on this London station to be extended to aid increased capacity. Core6 Pultruded was chosen for its non-slip and easy to fabricate properties. This entry was posted in Case Studies, Rail on June 6, 2016 by admin. Application: Safe track access walkway for the Rail industry for worker safety using Core6 moulded grating. Core6 is easy to fabricate, lightweight and non-slip.